The Heart's Desire Number, often referred to as the Soul Urge Number, is derived from the VOWELS in your full birth name. This is the inner you ... it shows your true motivation, your inner cravings and urges, likes and dislikes. It reveals the general intention behind ma it shows your true motivation, your inner cravings and urges, likes and dislikes. It reveals the general intention behind many of your actions, and dramatically influences the choices you make in life. Heart's Desire (aka Soul Urge) number is one of the core numbers that include your Life Path Number, Expression (aka Destiny) Number, Day Number (the day you were born on), and Personality Number. The Heart's Desire/Soul Urge number is derived from the vowels (A, E, I, O, U ... and sometimes Y) of your full name at birth. 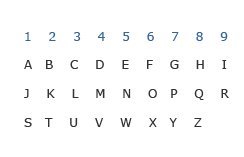 To calculate your Heart's Desire/Soul Urge number, assign each vowel of your name a number from the chart. Do this separately for your First Name, Middle Name (if you have one), and Last Name (Surname). For each of your names add the numbers up separately, reducing them down to a single digit value. When you have the numbers for each of your names, add these up and again reduce to a single digit to come up with your Heart's Desire/Soul Urge Number. The 1 Heart's Desire number indicates you have a deeper craving to rule over your own direction in life according to what you believe is right. More than others, you desire to be independent, and a leader of whatever venture, endeavour, or area of expertise you join or are a part of. The 2 Heart's Desire number indicates you have a deeper craving for peace, comfort and security. The gentle, sensitive, intuitive, and sentimental soul this number represents yearns for harmony in all aspects of life, and you are likely to be much more diplomatic and tactful, rather than forceful, in order to accomplish your goals. The 4 Heart's Desire number indicates your natural desire is for order and stability in life. You tend to prefer routine, structure and discipline over change, and are more likely to be very thorough and organized when dealing with any aspects of everything you do. The 5 Heart's Desire number hints at your deeper craving for freedom, new experiences, and change. Imaginative, creative, enthusiastic and resourceful, you are more likely to travel, seek adventure, and tend to be drawn to the less conventional, and more original ideas, opportunities, and people. The 6 Heart's Desire number indicates you tend to be more compassionate, sentimental, patient, and caring, and are able to empathize with people more so than others. As such, you are likely to focus more of your attention, and place much greater importance, on helping and caring for your family, loved ones, and those close to you. The 7 Heart's Desire number indicates you are more likely naturally introverted, and have a tendency to seek quiet, private environments. Your inquisitive, abstract, and theoretical mind draws you towards introspection, the love of knowledge, philosophy, and deeper understandings of all things in life. The 8 Heart's Desire number indicates you are more likely to be drawn to material comforts, money and even power and influence. Your ambition and determination, coupled with a creative mind and the ability to visualize the bigger picture, all combine to help you succeed where others may fail. The 9 Heart's Desire number indicates your tendency toward philanthropism and idealism, and causes that help advance the human race and improve the world as a whole. You can be sensitive and emotional, are more likely to be a perfectionist, and crave approval from the masses for your good deeds and achievements. What if you're a Jr would you include that in your last name? Hi Bert, normally suffixes such as Jr, Sr, or III are not used to calculate our numerological chart. However, if your birth certificate includes Junior in your full birth name you would include it for the analysis ... fully written as Junior. Hey, for some reason a lot of major life events centers around the number 18. Is this strange? Hello. My name is Michell Ann Myers. I would think that the y in my name is a vowel but it is being calculated as a consonant when using the Name Numbers Calculator. Is this correct? The calculator provides the numbers 9, 11, & 7. But if you calculate my life path number one way I get 16/7 - scary. Another way I get 25/7 - not so scary. Any thoughts on this? I've also read that you shouldn't use your birth year to get your life path number. If I calculate it this way, I still get. Concerned about that karma number though. Hello there ,let me start by saying I've never attempted to read or understand numerology before, that being said I am very good with numbers and I am curious to know what the reduction factor is. I was thinking that maybe it was based off of the number of vowels divided by the number of consonents. But I don't think that's right. My first attempt left my numbers all sorts of messed up according to your chart. I recieved a 8 for Gabriel, a 8 for William, and a 9 for Petrie. I am trying to learn something new and I am very open to criticism and ideas. Thank you. Me again, thought it would be funny to mention my birth weight was 8lbs 8oz and I was born Aug 17, 1992. I got my destiny and urge numbers now what?